The name of the titular character of the 1983 arcade game Mappy is probably derived from "mappo," a Japanese slang term for "policeman." Early typewriters had all the keys in alphabetical order but since the commonly used keys were closest together they kept sticking. Thus the qwerty keyboard was born. Also, early typewriters had no number 1. Instead they used a lower case L.
When I was a kid I had a typewriter made in the '40s or '50s that had no "1" or "0", it used "l" and "O" for these symbols. IBM typewriters had one feature lacking in many mechanical typewriters:The top row bore the digits 1234567890; other typewriters generally omitted the 1 and 0. The IBM design obviated substitutions taught by many typing instructors: o or O for 0; l for 1. These substitutions were easily identified when compared to an adjacent line typed with the digit keys and encouraged typists to confuse letters and numbers, even in speech. If the statistics shown in Call of Duty (namely the amount of kills made per minute) applied to a real life war, the entire human population would be dead in four hours. Last edited by Mickey the Luxray on Sun May 19, 2013 11:54 pm, edited 1 time in total. The origin of 1337 speak! Dr Pepper was invented in Waco Texas in 1885. The Dublin Dr Pepper, 85 miles west of Waco, still uses pure imperial cane sugar in its product. There is no period after the Dr in Dr Pepper. The Trans-Siberian railroad is 9,289 km long and runs from St. Peter's Burg to the Pacific. It took 26 years to complete and is the longest rail line in the world. Last edited by Radio Blue Heart on Mon Apr 22, 2013 1:29 pm, edited 1 time in total. The Trans-Siberian Orchestra has sold over 9 million concert tickets and 8 million albums. Kinda interesting their ticket sales exceed their album sales. I guess that's what happens when you're famous for your live performances. The second longest rail line in the world is the Indian Pacific. It's the straightest rail line in the world, with one stretch continuing almost 300 miles without a bend. The longest straightest road in the world runs alongside it, but the longest straight stretch of the Eyre highway is only 150 miles long. The Danyang–Kunshan Grand Bridge is the world's longest bridge. It is a 164.8 kilometres (102.4 mi for us Americans.) long viaduct on the Beijing–Shanghai High-Speed Railway. The biggest stadium in the world is the Strahov Stadium in the Czech Republic. It can hold 220,000 people. Of all the birds on the continent of North America, only two have a sense of smell. They are both vultures. User interfaces on computers are now more touch-oriented. Bad news for those who prefer mice. All of your fingers contain 3 bones, however your thumb only contains 2. The fingers contain more nerve endings than any part of the human body. Not surprising considering how we use them to feel things! I considered raising that point, but then thought "Nah, let the biomedical engineer do it!" It's really nice when people have a chance to put their education to use. The explosion of Krakatoa in 1883 was the loudest sound ever heard in modern history. It was heard up to 4800km (3000M) away. The explosion was so powerful it was still being recorded on barographs FIVE DAYS LATER and is estimated to have reverbated completely around the worl 7 times! The explosion was estimated to be the equivalent of 200 megatons of TNT. To put that in perspective, that's 5600 times the combined power of the bombs that destroyed Nagasaki and Hiroshima or 40 times the combined power of all the explosives used in World War II! The surface mines in Garzweiler, Germany can be considered as the biggest holes in the world. While mining for lignite (brown coal) in the section Garzweiler I a 66 km² big hole was dug. Presently Garzweiler II with an area of 48 km² is mined. Los Angeles building code requires all buildings 75 feet and taller to have a helicopter landing pad. This is apparently used for fire safety. It is also the reason that thumb screws and other finger-based torture devices are so effective. 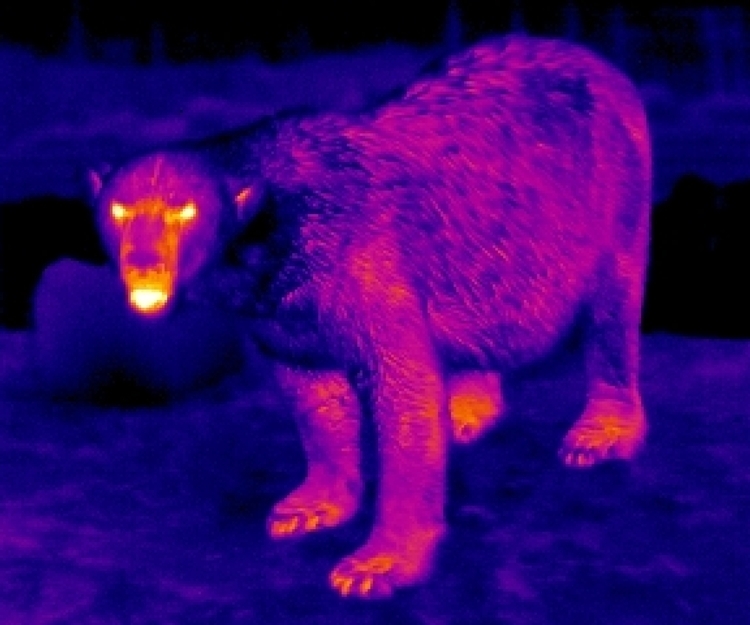 Polar Bears cannot be viewed on an infrared camera. This is due to the fact that their fur is in fact actually clear, not white. And their skin color is actually black. Polar bear fur is an excellent insulator, but it's not that good. Last edited by Argent on Sat Apr 27, 2013 5:42 am, edited 1 time in total. Puffins actually grow their distinctive red beak only for the mating season and lose it again soon after. Well yeah I'm an arctic fox! Even though Arctic Foxes have no nutritional value, they are very tasty! Well, I dunno about food, but I bet they make great hats! Hey, $3 an hour for an 18 hour workday is perfectly reasonable. The Fennec Fox is the smallest canine in nature. Despite being 10911m below sea level at its deepest point the Marianas Trench is not the closest point on the seafloor to the centre of the Earth. There are in fact several spots in the arctic which are up to 13km closer than the bottom of the trench, despite being much less farther underwater! This is because the Earth is not a perfect sphere - its radius can be up to 25km less at the poles than at the equator! The VSS (Virgin SpaceShip) Enterprise carries 15,000 pounds of solid rocket fuel per flight. By comparison, OV-101 (Space Shuttle) Enterprise carries around 2.5 million pounds of solid rocket fuel per flight. I'd be interested to know the difference in payload capacity between those two shuttles. And also whether they were based on Star Trek or it was based on them. The first ever invention to break the sound barrier was the tip of a whip. That's what makes the distinctive "crack" sound. From what I can see Lake Vostok is 500m below sea level and goes to a depth of just over 800m putting its deepest point at a total of roughly 1300m below sea level. Being at the pole I suppose it could be a contender for closest spot to the centre but I can't find any information to actually say that. Lake Baikal is the most voluminous freshwater lake in the world, containing roughly 20% of the world's unfrozen surface fresh water. It's mostly likely the oldest lake in the world. I need to make up some "Lake Vostok Waterski Club" tee-shirts some time.